"Jump over the high-voltage sparks to avoid being tossed from the ring." "If you stomp on a rival, you will stun them for a few moments." Take Me Ohm is a 4-player minigame in Mario Party 7. Its name is a pun on the phrase "take me home" and on "ohm", the unit for electrical resistance. 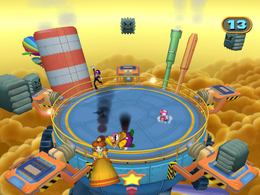 The four characters are dropped off onto an airborne platform via blimp that is surrounded by five Thwomps that are hovering over electricity conducting switches in a star-shape format. The characters have to vault over the ohms that the Thwomps produce. As the game progresses more electrical rays of energy are produced at one time, making it harder to survive. The last player standing wins. If two or more characters survive the barrage of ohms for the entire time limit (thirty seconds, or 60 if played in the Decathlon Castle), they will win too. This is one of the minigames that can appear in Decathlon Castle. Here, the player's objective is to survive as long as possible to earn as much points as possible, up to a maximum of 1,000. Any player who survives for 60 seconds gets the maximum amount of points. Each winner does his or her winning animation. This page was last edited on March 27, 2019, at 01:13.